CLARKS SUMMIT — A doctor nationally renowned for his advances in emergency heart care invented a device to prevent complications during catheterization. Samir Pancholy, M.D., an interventional cardiologist in Clarks Summit, helped introduce the nation to a less painful, safer way to insert a catheter through the wrist instead of the groin. 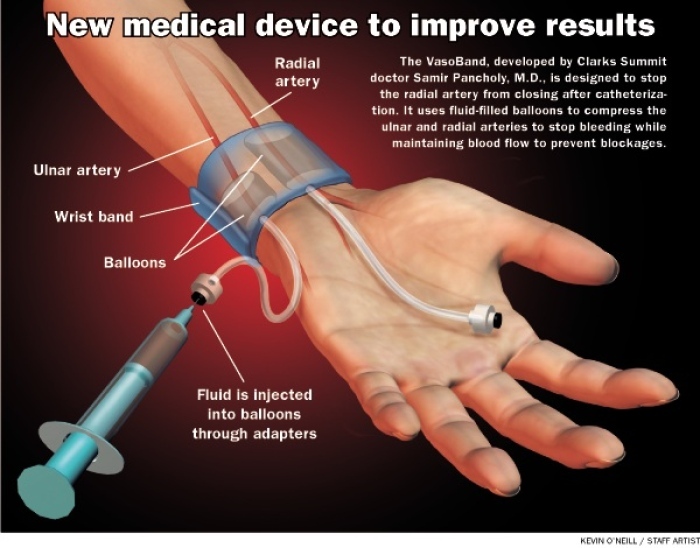 He is breaking ground with a device that prevents blood vessels from closing after the procedure. “One of the potential downsides of doing radial artery catheterization is that because it’s a small artery and we put equipment in there, it tends to close up or occlude,” Dr. Pancholy said. In May, Dr. Pancholy and VasoInnovations Inc., the company he started with several partners, received patents for VasoBand. VasoBand wraps around the wrist, covering the access point, and applies pressure to both the radial and ulnar arteries. It stops bleeding from the radial artery but keeps blood flowing to prevent occlusion after the procedure. Only a small portion of radial artery catheterizations led to closed arteries in 2002, when Dr. Pancholy first began the procedure — about 7 to 10 percent, he said. Through techniques he and colleagues developed in 2008 that later became nationally accepted best practices, they cut that down to 2 to 3 percent. However, those closed arteries mean grave complications later, and a tiny fraction of occlusions wasn’t good enough for the doctor. Because the radial artery loops around at the wrist and connects with the ulnar artery, blood still travels normally to the hand, and it’s possible that patient and doctor may never know the radial artery closed, Dr. Pancholy said.